This user's guide is a great way to learn about Zello's many features. These instructions are valid for Android devices running Android OS 4.0.3 and above. This user guide is separated into 2 sections. If you only want to talk one-to-one with personal contacts or with groups of people you already know, you only need to use SECTION 1 tasks. If you also want to meet new people, add and join existing Zello channels, or create your own channel, read SECTION 2 tasks as well. Search for the Zello app in the Google Play app store and tap INSTALL to download it and install directly onto your Android device. After download is complete, tap OPEN to open Zello and create your account. After installing, the "Z" logo badge appears on your home screen. Tap the badge to launch Zello. You’re on your way enjoying live conversations! You can use Zello to communicate with your friends who also have Zello installed on their Android, iPhone, iPad, iPod Touch, or Windows PC. If this is your first time using Zello, follow these steps to create a new Zello account. If you’ve created a Zello account on another device or platform, tap Sign in and follow the prompts to sign in. NOTE: If you are using ZelloWork and not the free consumer app, be sure to select ZelloWork. User guides for ZelloWork are at ZelloWork Support. If you need help with the password or username, do the following. Now you're all set with your new password. The Main Screen is Zello Central, where you can perform all routine tasks. Tap RECENTS to see missed messages and recent activity. Tap CONTACTS to add, delete, or manage contacts. Tap CHANNELS to add, delete, or manage channels. The Zello Menu is identified by the icon at the upper right corner (3 vertical dots). By tapping on the Menu icon, you can change your Status, access more Options, Sign out, or Exit the app. Do this sound test to confirm others can hear you. Release the button to hear Zello play back what you just said. The circle is green when playing back audio. If you can’t hear anything, verify your microphone is on, speaker is on (lower left), and volume slider (lower right) is turned up to a comfortable volume. Run the test again until you hear yourself speaking. Tap the Edit icon (pencil) at upper right corner. Languages you are interested in. When you’re done updating your profile, tap SAVE. Now let’s fill up your Contacts list. Tap the CONTACTS tab, and then the Add Contact icon at lower right corner. The Add a contact screen displays. If using the search field, enter a Zello username, email, or phone number into the search field and tap the Search icon (looking glass). If the user is not found, you can send an invite by email or text message. If the user has a Zello account, tap the username and Zello sends a connection request. Until contacts approve your request, they will show as “Requesting authorization" in your Contacts list. As soon as your friends go online, they will see a notification of a Contact request with options to either Accept, Decline, or permanently Block your request. If they agree to accept your invite, their status will change to Available or Busy. If the contact is not a current Zello user, you can add them from your Address Book. All contacts: Opens your Android address book. Contacts on Zello: Lists contacts from your address book with Zello accounts. Tap the names of the people you want to add or invite to Zello, then tap IMPORT. For contacts with Zello accounts, Zello sends them a connection request. After they agree to connect, they will appear in your Contacts list. For contacts who don’t have a Zello account, a dialog box displays options for sending an invitation. Select your preferred option. Zello creates a message with all the information filled in for you, but you can edit the message to your heart’s content. Happy? Tap Send to email the invite. Scanning a contact's QR code is the fastest way to add a contact. The QR code is located at the bottom left corner of the user's profile picture. From the Add a contact screen, tap on QR Code Scanner. Focus the green scanner box on the QR code until it is read in. The contact is automatically added to your CONTACTS list. A pending invite from another user is indicated by a red circle marker and "Requesting authorization" notice in your CONTACTS list. Press and hold on the user's invite to see a pop-up, where you can Accept, Decline or permanently Block this user's invitation. When your contacts appear online and has a Status of Available, you can contact and talk to them. Select the username, press and hold the push-to-talk button until solid red while talking. Release the button when you finish talking. If the person is Available (solid green circle), you should get a reply soon. When someone is Busy (orange circle), Zello saves your message in their history for later listening. If a contact shows Standby (empty green circle), it means the user doesn't have the app running at the moment or connection has been lost, but you still can send offline messages to the contact. When the connection is restored, any missed messages wlll play automatically. From the pop-up menu, select the action you want to take. To delete a contact, press and hold the name of the contact in your CONTACTS list to display the pop-up menu, then tap Delete contact. You can send alert tones and text messages to a contact. The receiver will hear an audio tone or feel a vibration that repeats every minute until the person accepts or dismisses the alert. You can add a text message or links. To send a call alert, tap the Call Alert icon (bell) from a contact's talk screen and enter optional text. When done, select SEND. You can also long press on the Call alert icon to send a default message of "Zello me!" instantly. When your status is Available, all incoming messages play in real time. Messages are also saved in History or you can press the Replay icon to play back instantly. When you change your status to Busy, incoming messages are not played real time, but are instead saved to History. You will receive a vibrate alert and missed message marker in the Notifications bar when a message is received. You can listen to the message at a more convenient time. Solo status is used when you want to talk to only one contact, muting other contacts or channels that may be transmitting at the same time. You can then go into the History to hear any missed messages. When you set Status to Offline, Zello does not save any new messages. It retains the messages you already have prior to going Offline. After going Offline, contacts will initially see you in Standby mode (empty green circle) and they can still send you offline messages for up to a week. If you don’t use Zello for one week or longer, it will automatically change your status to Offline, and you will not receive offline messages. You can customize a message for others to see when you’re Busy. To do this, tap Set status message and enter the message. We've simplified the configuration steps for adding accessory and mapping device buttons beginning with Android version 3.67+. 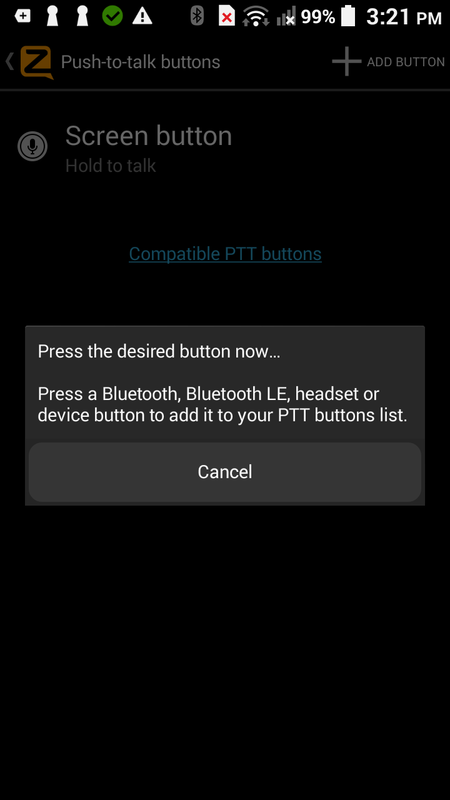 On Android devices, you can map any hardware key as a PTT key. Please note that the talk screen must be in the foreground for the button to work. History: Turn History on and off, delete content in History, and specify maximum storage allowed for audio messages and images. Support: Support FAQs, send in problem reports, adjust permissions, advanced settings. Unless you sign out from Zello, the app runs in the background regardless of your status. You’ll continue receiving messages and notifications. To shut down Zello, tap the Menu icon and Sign out. If you want Zello to send notifications and automatically start when an incoming message is received, tap Menu icon and Exit. This may help conserve battery while allowing you to still receive messages. NOTE: If the account owns any channels, you will not be able to manage the channel once the account is deleted. It is recommended that you transfer the channel to a mod or admin in the channel prior to deleting the owner account. To add participants, tap More Options (down arrow) on the talk screen. Groups are only accessed from Recents. To delete a Group, swipe the Group name to the left and tap Delete. Channels are unique to Zello....Channels are real-time talk groups which can run 24/7, similar to radio stations. Channels can be private or public, for people you know, or people you want to know, from all corners of the world. Tens of thousands of channels already exist on Zello. Join in the conversations or make your own channel in minutes. Scanning the channel's QR code. The three methods are described in more detail next. 1. Tap on CHANNELS icon. 3. Select Trending channels to display lists for Filtered pre-approved channels for general audiences or All channels which includes Filtered and 18+ channels. 4. Tap on the channel name to see the channel profile and tap +ADD at upper right corner if you want to save it to your CHANNELS list. Connect to the channel by tapping the Power icon until blue to listen and talk in the channel. Tap the power icon until gray to disconnect from the channel and stop receiving messages. If you want to stay connected but mute the channel, tap on the Pull-down menu and select option to Mute the channel. See the channel you want? Tap on the name and then tap +ADD to add the channel to your Channels list. The fastest way to add a channel is by scanning the QR code which looks similar to the image below. The channel QR code is located on the bottom left of the channel's profile picture. Once read into your device, the channel is automatically added to your Channels list. To talk in the channel, make sure you are connected (Power icon is blue) and then push and hold the big button until solid red to talk. As long as no one else is trying to talk, you can talk as long as you want. If other users are trying to talk, the talk time before interruption is set by the owner in the channel profile (1 second to 10 minutes). When you’re connected to multiple channels, you’ll hear every conversation for all active channels, which can become rather confusing. You can set your Status to Solo (solid blue circle) to talk to a single contact, while silencing other contacts and channels. Missed messages from silenced contacts and channels can be replayed in History. If you want to mute all channels and contacts, you should change your Status to Busy. However, if you only want specific channels to be muted, tap the Pull-down menu on the channel's talk screen and select the Mute channel option. All missed messages will be sent to the channel's History and can be replayed at a later time. If the owner of the channel has enabled texting, images, and location sharing, you can perform these tasks from the History/Conversation screen. To share your location, tap on the Pull-down menu and select Send location. You can create your own channel to talk about an interest, activities, or any topic as long it complies with our Community Guidelines. Once created, you become the "owner" of the channel. Contacts who join your channel are "subscribers". The number of subscribers allowed per channel is unlimited, but there is a maximum of 3500 who can be online and active at any given time. Channels are permanent until deleted by the owner. For more information about Channels, see Channel Quick Start Guide. Follow these steps to create a channel. To authenticate a user's identity before joining your channel, turn on Require verified email and/or Require verified phone number options. Happy with your channel settings? Tap Create to start inviting contacts to your channel. As the owner, you can edit your channel profile settings at any time. Tap Invite friends, then select the users you want to invite from either your Zello contacts list or Address book. Tap INVITE to send a channel invitation to the contacts you've selected. Another way to invite someone to a channel is to press and hold on a channel from the Channel list and tap Invite friends from the pop-up menu. On the Share channel screen, tap Share icon to see options to select from. Want to make changes to your channel settings? Tap SAVE when done making changes. A well-moderated channel attracts more subscribers. Owners can assign Admins and Mods to help moderate channel activity by removing disruptive users and pre-screening users in Zelect and Zelect+ type channels. There are two ways to add Admins and Mods and manage online subscribers: from the History/Conversation screen or by using the Users list. If the user sent a message to the channel is still listed in the History, press and hold on the username to see options to Block, Prohibit talking, Bounce, Revoke trusted status, Make moderator, Make administrator, or Mute. On the channel talk screen, tap the Users icon at top to display a list of online subscribers. Tap the user's profile picture to open the account profile. In this example, we tapped open Sueme2's account. Tap on the Pull-down menu icon (down arrow). From the pull-down screen, select from the list of options to manage the user on the channel: Block, Prohibit talking, Bounce, Revoke trusted status, Make moderator, Make administrator, or Mute. Make moderator gives user the ability to manage other subscribers. Mods can block, Prohibit talking, Bounce, and Revoke trusted status. Make administrator gives user the ability to manage subscribers and make certain changes to channel settings, such as changing the profile picture, description, and talk interval times. Mute to turn off user's audio. You can easily manage moderators, adminstrators and blocked or trusted users by tapping on the channel profile picture to open the channel profile. There, you will see lists for blocked users, users prohibited from talking, trusted users, moderators, and administrators. Select a list and tap on the user's profile picture or long press on the username to manage the account. Tap Send at upper right corner. Recipients who have opted to receive alerts (see next section) will receive an audio alert and the text message. Turn on option to receive alerts and specify when to receive alerts. To delete a channel you are currently subscribed to, press and hold the channel name until the pop-up appears and then tap Delete channel. To delete a channel you own, go into the channel profile screen and select the red Delete button at bottom of channel profile. Click red Delete channel for channel you wish to delete. On the History screen, clear all history by selecting Clear all. Or select to delete only VOICE MESSAGES, IMAGES, ALERTS, LOCATIONS, or TEXTS. You can also specify storage maximums for voice and images. NOTE: Be careful when deleting items from history. Once deleted, there is no way to recover the deleted information. This user's guide should kick-start your Zello experience. When you’re ready to dig deeper and discover more features, check out our Support Center and Forums.